Ninject is one of the best tool for dependency injection that i use. I tell about how to use with sharepoint in this article. 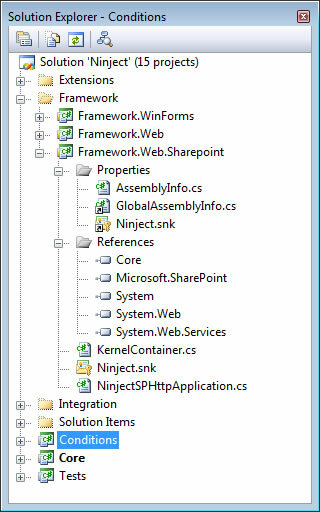 For working with Ninject in Asp.net you should inherit Global class with Ninject.Framework.Web.NinjectHttpApplication but in sharepoint standart Global class is derived from Microsoft.Sharepoint.ApplicationRuntime.SPHttpApplication. the second reason that i recompile ninject source. You can download Ninject Source Code from project site of Ninject. Than i created a new project in Framework folder. And add references of Microsoft.Sharepoint library. that just inherits SPHttpApplication inspite of HttpApplication. All members code as same as Ninject.Framework.Web.NinjectHttpApplication class. And build the all solution. And i also add functionalities of UserControlBase and WebControlBase classes for injection about a good case. After your ninject dlls ready you should add this dlls to your 80/BIN folder and register with GAC and add to your sharepoint application web.config file. I don’t tell how to register custom assemblies in sharepoint asume that you know already. After you complete this you can change that your Global.asax file in your Sharepoint wss root folder. Ninject is the ninja of dependency injectors.Ninject is a lightning-fast, ultra-lightweight dependency injector for .NET applications. It helps you split your application into a collection of loosely-coupled, highly-cohesive pieces, and then glue them back together in a flexible manner. By using Ninject to support your software’s architecture, your code will become easier to write, reuse, test, and modify.